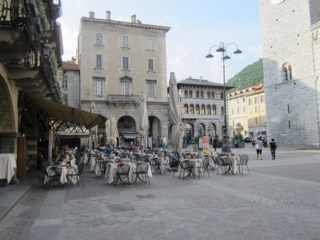 The town of Como is not just the gateway to the villages along Lake Como, it is a destination in itself. Surrounded by mountains and fronting the shores of Lake Como, it has a lot to offer its visitors. How about starting with a nice, cool prosecco at the Piazza Duomo as you watch the play of light against the walls of the Cathedral? The construction of the Cattedrale de Santa Maria Assunta or the Duomo di Como was began in 1396 and it was completed in 1770, nearly 4 centuries later. The front façade features a rose window flanked by statues of the illustrious Pliny the Elder and Pliny the Younger, both natives of Como. As I was walking around town, I was struck by this architectural overhang, typical of medieval houses. Surprises abound in Como.